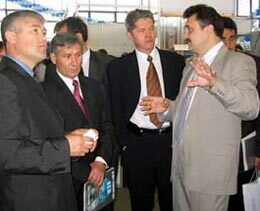 On May 2005 the Russian Radiology and Nuclear Medicine Scientific Center received the All-Russian Scientific and Practical Conference “Condition and Development of the Russian Federation Mammalogical Service”. The possibility for large implementing of radiothermometry (RTM) to find out and to control the treatment of mastopathies was discussed in the framework of the conference. The statistics obtained in the Chelabinck Region Oncologic Dispensary and published in conference's materials under the heading “Radiothermometry possibilities in RMG diagnostics” confirmed the RTM-method efficiency. The studies performed by the RMAPO Radiology Chair officers under the name “Radiothermometry according to the menstruation phase between women in the childbearing period” have excited interest too. At the Showroom of inventions and new technologies in Geneva lasted from 6 April till 10 April 2005 Slovenian medics together with Russian scientists (Ivan Zrimzek “MOGY” and Sergey Vesnin “RES Ltd”) presented a method for early detection of mastopathies (radiothermometry) based on the noninvasive measuring of interval tissues' temperature. This exploitation was awarded with the Gold Medal and special reward as the best invention in medical field. The doctor Zrimzek's enthusiasm who has popularized the RTM-technology in the European countries several years was rewarded with a special diploma and Prize of the Industrial Property Protection Agency. Ch.K. Mustafin, K.F. Vartanyan, E.A. Pavloca. How is the RTM-diagnostic used in medical practice? At the same time in a great number of medical centers experienced and interested specialists use RTM-01-RES Diagnostic Radiothermometer in a more extensive manner. The noninvasive measuring of internal tissues temperature helps in examination of thyroid body, detection of bloodstream disturbance in lower limbs, arthropathies and vertebral column disease, detection of metastases in bones and lungs. The infrared sensor, a part in the microwave radiothermometer, is indispensable in melanoma diagnostic. The research concerning the use of the RTM-method in gynecology both for oncologic and inflammatory disease diagnostic and control of manipulation physiotherapeutic procedures is carried out. Where is the RTM - diagnostic used ? You can get an answer to this question in the RMAPO Chair of Clinical Radiology and oncologic dispensaries in Samara and Kaluga, in the National Laser Medicine Science Center and in the Oncology Department in the Polyclinic No 92 of Moscow Central Administrative District, in the Road Clinical Hospital No 6 and Medical Departments of large manufacturing outfits in Moscow Region and Bashkiria as well as in a number of private medical centers in Moscow, Chelyabinsk, Novosibirsk, Kirov, Krasnoyarsk, Saratov and Barnaul. In 2004 these medical establishments installed and now they successfully use the RTM-01-RES Diagnostic Radiothermometer composed of a computerized diagnostic system for early detection of breasts cancer. Last year following Russian specialists, doctors in India, Kazakhstan, Lebanon, Germany and Portugal implanted too in their clinics a deep radiothermometry method for detection and control of disease treatment including that oncologic when the temperature in internal tissues changes. The existing possibilities for image of examination results have been extended with a viewing and printing procedure of the new protocol representing a document reflecting all the examination cycle. The protocol contains not only the patient information but also temperature fields received at measuring of deep and surface temperatures. Besides, to make the analysis convenient, the protocol has a combined thermogram and core temperatures asymmetry represented graphically and in the form of a temperature field respectively. The Reports of the Second Annual Russian Scientific and Practical Conference “Thoracic Oncology” published run-downs of the report “Radiothermometry – method for control of the postoperative brine in breast cancer carriers”. The material has been prepared by the Candidate of Medical Science Mustafin Ch. K. and the Candidate of Science Vesnin S. G. as part of the study performed in 2004 on the Chair of Clinical Radiology of the Russian Post-Qualifying Education Medical Academy. 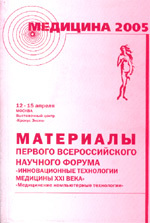 The Actual Oncology journal, volume 6, No 1 for the 2004 year, in the section “Actual problems of the clinical oncology”, has published the article “Radiothermometry in Breasts Multipurpose Survey Algorithm” prepared by the authors on the basis of clinical checking in GU RONTS named for Blokhin N. N. and sexennial experience in the RTM-01-RES Diagnostic Radiothermometer use in Moscow Board of Health Mammological Dispansary. The statistics presented in the same edition in the article “Comparative analysis of results in examination of breast cancer carriers on the basis of the data of X-ray-mammographical and radiothermometric checkup” shows in a conclusive way the actuality of joint use of these two methods to reduce essentially the number of false-negative conclusions. On June 13 Burdina Larisa Markovna, head of Moscow Mammological Dispansary Branch No 1, told breast disease and radiothermometry as a diagnostic method in the mammaology in the program “Health” on the First Television Channel. The patient examination in the Ostankino workshop has been realized using RTM-01-RES Diagnostic Radiothermometer. A new modification of the RTM-01-RES Diagnostic Radiothermometer Diagnostic System has been developed. The kit includes a sensor for measuring deep temperatures RD-4000 operating on the 3800 Mhz frequency. The new sensor is characterized with an increased noise immunity, indications stability, smaller dimensions and weight. The measurement time has been reduced down to 4 seconds. Moreover a stable growth in sales of the RTM-01-RES Diagnostic Radiothermometer completed with the RD-1100 radio probe has given leave to cut the production cost price and prime cost for this modification. The differential characteristics of the RD-1100 radio probe are the capability to detect temperature anomalies at a depth down to 7 centimeters and high sensitivity of the expert system for differential diagnostics of breast cancer. The conjoined use of a low frequency and high frequency sensors in the RTM-01-RES structure considerably expands its possibilities for diagnostics. 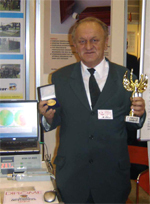 The edition of the Children's Wellness Scientific Center in the Russian Academy of Medical Sciences has published a book of the Candidate of Science Viceblat Alexander Vladimirovich “Radiothermography as a Diagnostic Method in Medicine”. 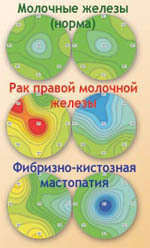 The present work has been written on the basis of lectures read by MIREA students, materials used in teaching radiothermography techniques in the diagnostic practice for doctors. Besides, the work has included the development results of the RTM-01-RES Diagnostic Radiothermometer received in the RES Ltd as well as materials of a number of author's publications. You can order this book by phone in Moscow (095) 261-31-47 or e-mail res@resltd.ru . The Ministry of Public Health of the Russian Federation confirmed guidelines “Microwave thermometry as an additional diagnostic instrumental criterion of pericranial and cervical kinesthetic damages at the chronic cephalalgia syndrome”. The recommendations have been prepared on the basis of studies performed in the in the National Laser Medicine Science Center . Patients examination has been conducted using RTM-01-RES Diagnostic Radiothermometer enabling to define the temperature of core tissues. The RES Ltd. has been awarded with a diploma for “Estimable presentation and promotion of its products and services on markets of the Republic of Bashkortostan ” following the results of the “Medicine” Exhibition held in Ufa from October 14 till October 17. The exposition has presented RTM-01-RES Diagnostic Radiothermometer designed for detection and control of the disease treatment including that oncological when there are changes in the temperature of core tissues. Photo: Director General of the Firm Vesnin Sergey Georgievich discusses with the administration of the Ministry of Public Health of the Republic RTM-method's diagnostic possibilities and outlooks of its use in the realization of screening programs concerning early detection of breast and thyroid body diseases. Our Web site presents the synopsis of the thesis dissertation for the degree of Candidate of Medical Science “Deep radiothermometry in diagnostics and dynamic control of the acute pyelonephritis treatment”. The competitioner is Shirshov Vasili Nikolaevitch. The work was realized in 2003 on the chair of urology and operative nephrology in the faculty of medicine of the Russian University of Nations Friendship. Research manager: Doctor of Medical Science, Professor Avdoshin V.P. Official opponents: Doctor of Medical Science, Professor Borisov V.V., Doctor of Medical Science, Professor Shapligin L.V. Radiothermometric diagnostic criteria for different clinical entities of the acute pyelonephritis have been developed for the first time. A high diagnostic information capacity of the RTM-method has been demonstrated in an early detection of the acute pyelonephritis which is comparable with the ultrasound investigation, radiographic and clinicolaboratory examination techniques. A RTM-monitoring scheme has been proposed to evaluate treatment efficiency. 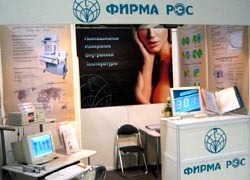 The radiothermometry has been marked as an up-to-date informative trend in the diagnostics of breast diseases at the II-nd All-Russian conference “Scientific-organizational aspects and modern diagnostic and treatment technologies in the mammology” held in Moscow in the Russian Scientific Center of Radiology and Nuclear Medicine of the Ministry of Public Health of the Russian Federation in May 2003. The report “Radiothermometry in Breasts Multipurpose Survey Algorithm” prepared by the authors on the basis of the sexennial experience in the RTM-01-RES Diagnostic Radiothermometer use in Moscow Mammological Dispansary Branch No1 well and demonstrably proved that idea. The report conclusions and statistics presented in the article “Comparative analysis of results in examination of breast cancer carriers on the basis of the data of X-ray-mammographical and radiothermometric checkup” indicate strongly the necessity of large implementation of the RTM-diagnostics in Russian medical institutions. More than 400 visitors of the exhibition " Medtekhnika - 2003" in Moscow were attracted by the stand with the poster "Non-Invasive Measuring of Internal Temperature". Although leading European, American and Japanese diagnostic equipment manufacturers displayed their devices at the exhibition, it was the Russian diagnostic complex RTM-01-RES developed by Moscow scientists that enjoyed particular popularity. RES Ltd. presented statistics on the use of radiothermometry (RTM-diagnosis) in the field of mammology. The specialists of the firm spoke about new diagnostic opportunities and shared their diagnostic experience in neurology, gynecology and urology. In the course of the discussion, launched by those presentations, some practicing doctors also brought in the ideas of using radiothermometry for such purposes as localizing muscle microtraumas in sports medicine, monitoring hypothermia treatment, phlebology, and taking animals’ temperature. The works concerning use of RTM-01-RES for diagnostics of renal diseases are now available in our website. Radiothermometric diagnostics of acute pyelonephritis gravidarum. V.P. Avdoshin, V.I Andriukhin, V.N. Shirshov Moscow, Russian University of People Friendship, Department of Urology. Materials of the 3rd Scientific and Practical Conference "Health and Education in 21st Century". Radiothermometric diagnostics of renal inflammatory diseases. V.P. Avdoshin, V.I Andriukhin, V.N. Shirshov Moscow, Russian University of People Friendship, Department of Urology. Materials of the 3rd Scientific and Practical Conference "Health and Education in 21st Century". Using of radiothermometry in diagnostics of acute pyelonephritis. V.P. Avdoshin, V.I Andriukhin, V.N. Shirshov Moscow, Russian University of People Friendship, Department of Urology. Vestnik RUDN. It is shown efficiency of RTM method for acute pyelonephritis diagnostics in these works. In the Proceedings of the III Russian Scientific Forum “X-Ray Diagnostics and X-Ray Therapy in Clinic of XXI” held in Moscow from 17 to 19 April three reports devoted to microwave radiometry have been published. A report by Timur Yu. Gousseinov and Sergey G. Vesnin "Microwave Radiometry as Diagnostic Criterion of Muscular Disorders in Tension Headache” is devoted to the use of the RTM-01-RES microwave imaging system for the diagnostics of muscular and articular disorders in tension headache. For studies 65 patients with tension headache were examined. Investigators measured the internal averaged temperature in 20 points at microwave frequencies by the RTM-01-RES microwave imaging system. The studies have shown that microwave radiometry (RTM-Diagnosis) reflects a certain value that depends on the ratio between the metabolic level and microcirculation in the examined area. These changes also appear for the muscles palpated with tenderness. Thus RTM-Diagnosis is promising as an objective diagnostic criterion of the muscular disorders in tension headache. The second report by Timur Yu. Gousseinov and Sergey G. Vesnin “Microwave Radiometry as Prognostic Criterion of Treatment of Tension Headache Associated with Muscular Disorders” discusses the data of measuring the temperature in the back surface of the neck in patients with tension headache before treatment. RTM-Diagnosis was performed with the RTM-01-RES microwave imaging system. The measurement data were compared with treatment results in 6 months after treatment. Investigations have shown that patients with an originally lower temperature in the cervicothoracic transition had a better treatment result. In the previous report authors noted that such a thermal abnormality appeared in patients with neck muscular disorders. So positive results can be expected after using the treatment method discussed in the report in patients with muscular disorders accompanied by a typical thermal pattern. 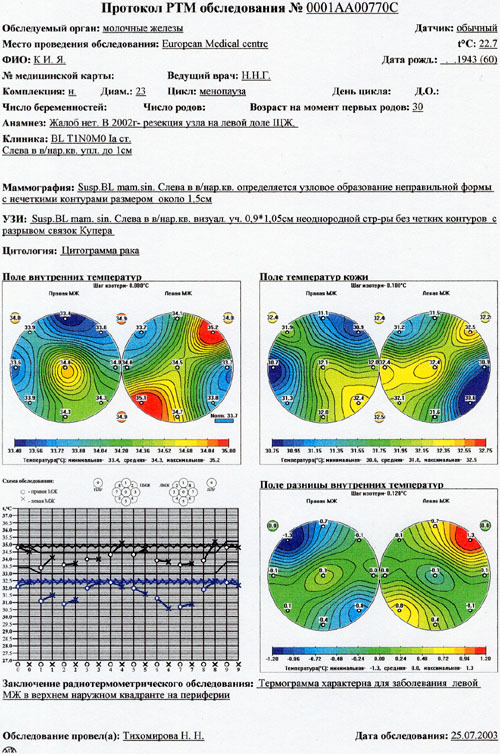 The report presented by Larisa M. Burdina, Ievsey G. Pinkhosevich, Vladimir A. Khailenko, Sergey G. Vesnin and Nadezda N. Tikhomirova “Experience of Using RTM-01-RES Radiometer for Breast Cancer Diagnosis” demonstrates results of using the radiometer in conjunction with other diagnostic methods in Brunch №1 of the Mammology Health Centre during 5 years. For this period 2233 examinations have been performed and 1506 patients with various breast diseases were examined. The results have shown that when RTM-Diagnosis is used in conjunction with Mammography the sensitivity for breast cancer diagnosis is 98%, while for each method independently it is about 90%. Authors notice that that RTM-Diagnosis is a very effective method for the monitoring of the therapeutic treatment of benign breast diseases. The method is absolutely harmless, so it can be repeated many times. In conclusion authors denote benefits of the method and that it is useful to include it in the complex breast cancer diagnostics.